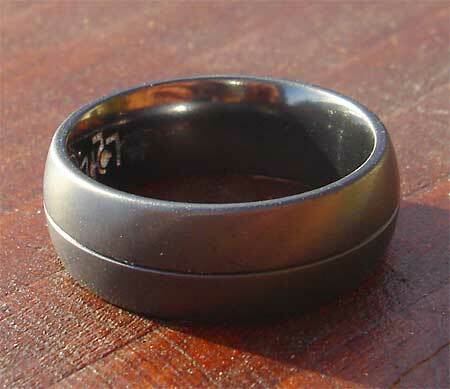 Men's Domed Black Wedding Ring : LOVE2HAVE in the UK! 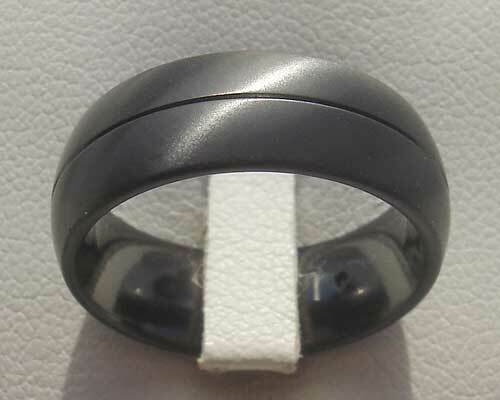 This men's wedding ring is a classic dome shaped ring made from zirconium. The zirconium is entirely black, and the design features a central groove that runs around the entire outer. It is a lovely subtle design. While the design pictured here is an all plain satin, the grooved design lends itself to twin finish styling also, with a different finish on either side of the groove or slot. This slot means that if you like, one-half of the ring can be polished, while the other can be satin. All polished is also available, so please specify your choice of finish into the comments box at check out. The width is 8mm as standard, but others are available. Please email us for further details. Profile(s) Available: Domed comfort fit. Finish(es) Available: Satin, polished or a combination.